Have you ever noticed that when everything is unorganised you feel more negative? Maybe stressed, unhappy or overwhelmed? 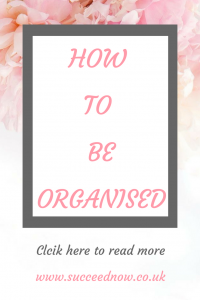 Are you wondering how to be organised? Since becoming more organised and tidy I have noticed a huge boost in my happiness. To the point where now I can’t sit and work if there is something untidy or unorganised in the same room. Once I have organised the area the negative feelings disappear and I can focus on what it is I’m doing. How organised do you think you are? Give yourself a score out of 10. Think about all the areas of your house, your clothes, your paperwork. Then think about your career, your social life. Are you someone that puts an event in your diary or phone and knows what you’re doing? Or are you rushing around, forgetting events or appointments or turning up late? None of these make you a bad person, but if it is something you’d like to change this post will help you. The thought of organising your house may already be making you feel overwhelmed. The best thing to do is to break it down into small chunks. I love my goal setting so obviously will be mentioning that. I would start by making a list of all the areas, then schedule 10 minutes a day to work on each area until it is organised. Then move otothe next area. Continue this until the list is all ticked off. It doesn’t take hours of constant tidying to get organised. 10 minutes a day for a few weeks and that to-do list will be complete. So like I said before, once you’ve set your goals and created your to do list you can then start scheduling time. I recommend the same time everyday so it can become a habit. For example if you are most productive in the morning schedule it for then. Commit to that same time everyday and it will become a habit before you know it. Since getting my car I’ve realised the importance of keeping paperwork organised and safe so it’s there when you need it. How do you currently keep your important documents? I would recommend getting a folder to organise all the documents into groups so they’re all in one place and easy to find when you need them. It will save you so much stress when you need a document and know exactly where to get it from. Whether you are employed or self-employed organisation is a great skill to have. I find that it helps me focus when I’m organised, when I know what I have to do and by when. In my business, I keep all my paper documents organised in a folder. All my photos and documents in folders on a usb stick. The documents and pictures I may need to use from my phone are also stored in a Dropbox folder so I can access from my phone and laptop. I keep all my goals organised on a memo on my phone so I always have them available and can tick them off with an emoji when complete. My daily to-do list is organised in Asana so I get reminders and can check them off when complete. I can also set events to repeat on Asana which I find really useful for my weekly tasks. My office space is minimalistic and organised, I only have a pencil pot and laptop on my desk which is all I need. All notebooks and other things stay away on a bookshelf until I need them so they don’t distract me or take up my space. As I’m very busy with work, business, bowls and social life it is key for me to be organised and know when I’m busy and when I’m free. I use the calendar on my phone and a whiteboard planner in my lounge so I can see six weeks ahead at a glance. I hope this gave you a few ideas. Are you going to start working on getting more organised? Let me know how you get on, I can’t wait to hear. I also always organise all my paperwork in a folder 🙂 so much more safe and practical! Oh god paperwork… I’ve got so many documents and uni notes that it’s all over my room. And when I need something from the piles that have formed over time the sheer thought of having to look for that gives me shivers. I def need to be more organized. Thank you for such a helpful post. Thanks for these useful tips to get more organised. The only thing is I can work in an untidy house, but I do see your point. It’s much better to work in more conducive environment. I love the fact that you included goals in this post. So often we forget that goals are a huge part of accomplishing anything – including being more organized! Never underestimate the power of making a schedule and writing things down! Blogging and working a day job has really got me feeling all over the place, so I definitely need to implement some of these tips to be more organized and efficient with my time! Paperwork is my downfall! There’s just so much of it! Thanks for the tips. I’m usually super organized with my work, and I’ve gotten better in other aspects of my life in more recent years, but I can always improve! Thanks for the awesome tips! A planner helps soooo much for me!! Thanks!